You will start your tour at the Ringstraße and head towards the Prater, Vienna´s famous amusement park. Taking a ride on the Giant Ferris Wheel, you will get a marvelous view over the city. 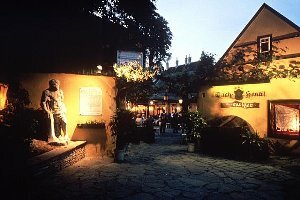 From there we will take you to a Heurigen in Grinzing, where you will spend an unforgettable evening accompanied by traditional music and a good glass of wine.